While I don't like the taste of a pumpkin spice latte, I do love the color. Not quite orange, not quite brown, the color becomes a neutral like olive green that looks great with other neutrals but spices up jewel tones and makes surprisingly beautiful color combinations. Paired with berry, plum, teal, navy, mustard, red, or purple, pumpkin spice adds an unexpected elegance and glow. 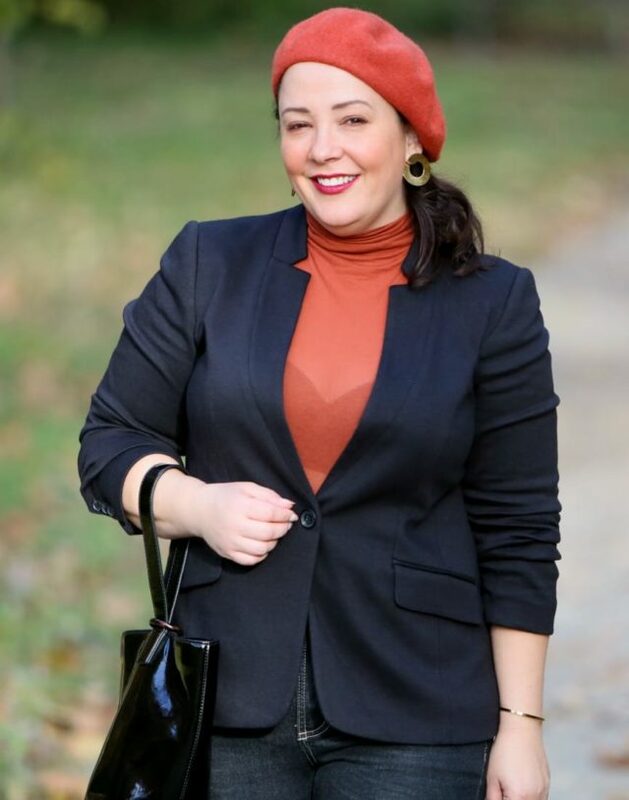 Looking for pieces that will add warmth as well as style to my winter wardrobe, I recently picked up this tissue weight turtleneck and beret. The plan is to wear this turtleneck under other sweaters, but when trying it on, I love the daring feel of it just with a solid bra under a blazer. Not a look I'd wear everywhere, but it shows how the piece can live multiple lives. It would also look great with a fitted camisole underneath. 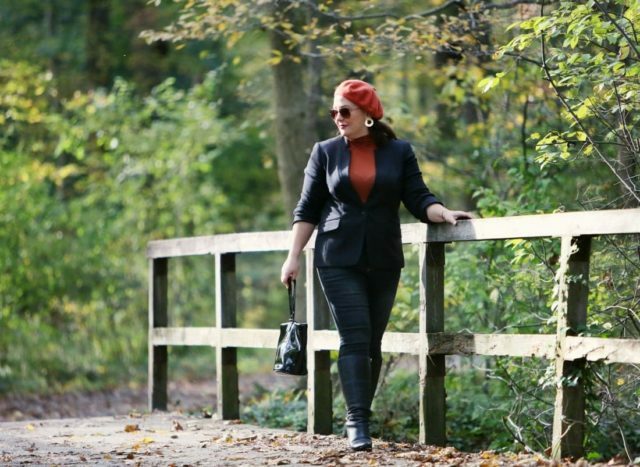 As for berets, they're one of my go-tos for dealing with bad hair days while staying cozy warm. I like that berets have a bit of style but aren't too big, so you can leave them on when you head inside. I decided to try out Rent the Runway Unlimited. I had so many friends try it and rave about it, I thought it would be a cool way to try new designers, experience more expensive fashion, and have more variety of bags and accessories without buyer's remorse. I've had three deliveries and so far this bag is the only thing I have actually used. And this bag, while it's super cute, it's not practical for my lifestyle. I find being a cusp size is really rough for RTR; a size 14 in most higher-end brands fits like a 10 in a mall brand and a 16 is a 16W and therefore too big for me. And then on top of it being petite, a lot of what I've ordered has been way too long. The accessories are often last season's styles so I can't really find much to update my look for the current trends. I hope it will prove useful through the holiday season with parties and events on the calendar, but I don't know if I'll stick with this program. Have you tried Rent the Runway or their monthly rental program Rent the Runway Unlimited? What are your thoughts? I was out of town recently for a work related conference and a few vacation days, A cafe close to our hotel made the most delicious pumpkin bisque soup. Once I discovered that soup I was over there every night for that soup. 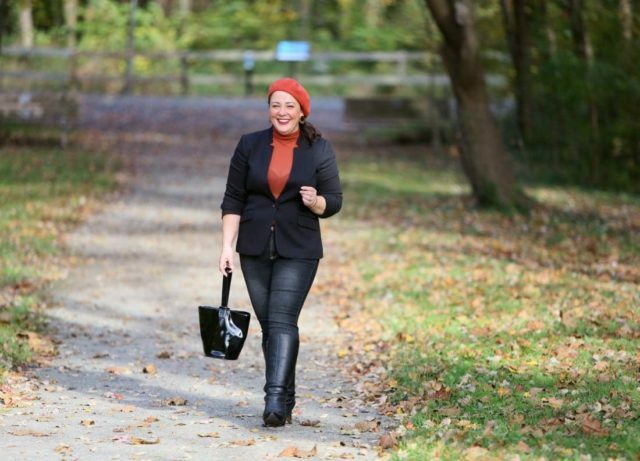 You put together a wonderful outfit today and the pumpkin color does suit you. It’s such a “delicious” color and goes so well with the Fall Season. Looking great! I love a blazer. I’d probably never use RTR, I just don’t live that kind of lifestyle. I do have a dressy capsule that sees me through most festive events. I’ve got a reversible black velvet / gold silk brocade jacket, a short black kimono with gold embroidery, and a white crepe Nehru style jacket to wear with a long skirt, silk pants or dressy jeans. But with holiday events coming up, I’d love to see a dressy capsule post. As always, you look terrific. I’m glad you showed us just how see-through! 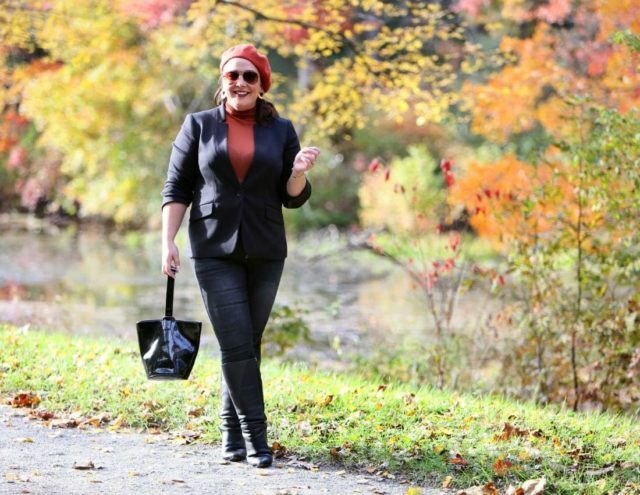 that lovely turtleneck is LOL I think your move to full-time blogging has given you an extra glow and your exercise program makes you look sleeker than ever. You’re an inspiration. 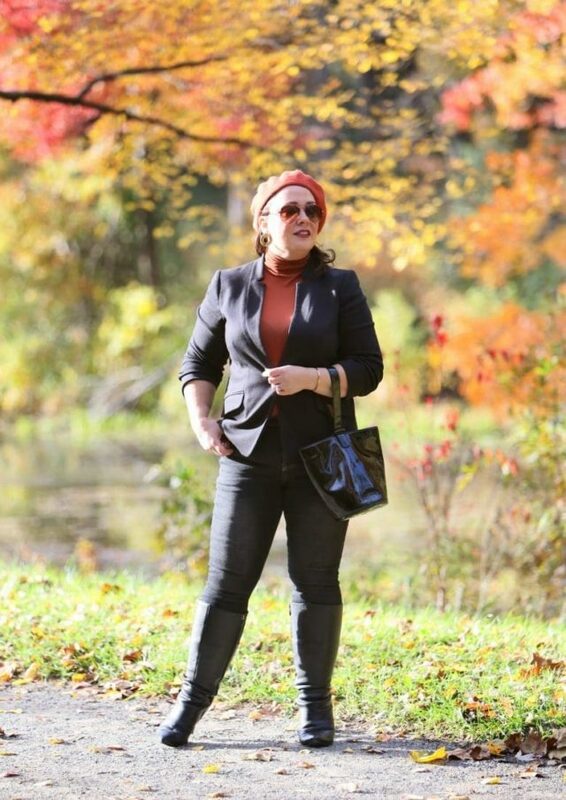 Pumpkin, or burnt orange, or whatever you want to call it, has been one of my favorite colors since I was a little girl, picking it out of the big box of Crayolas. I wore a dress that was a gorgeous dark shade of this hue for my high school senior portraits. Over the last decades, sometimes I’ve let this obsession sleep, but for the past few years it has been going really strong. I have bought many iterations and also knitted and embroidered others. I can’t seem to get enough! So it goes without saying that I adore this outfit, and seeing you in it sparks joy!!! !